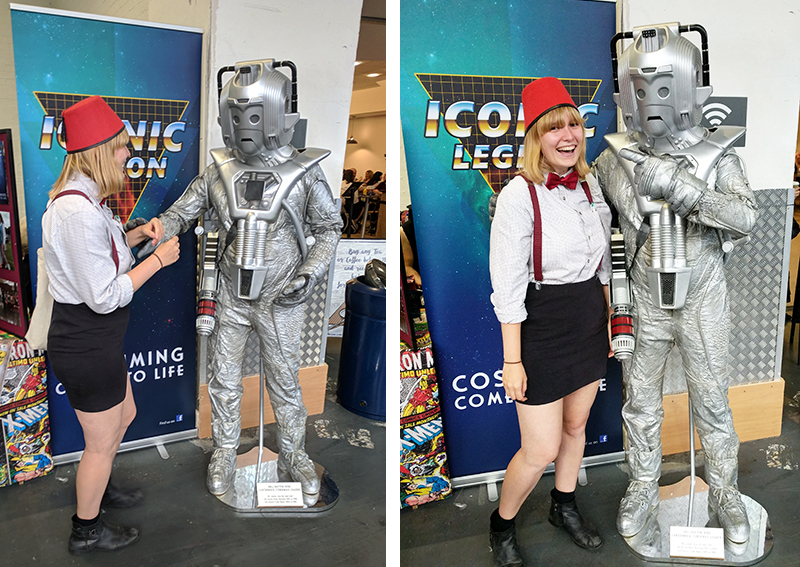 I had THE BEST time at London Film and Comic Con. Honestly, 24 hours on I’m still absolutely buzzing, and wish it was the weekend all over again! Going to a convention like this has always been on my list of things to do in London. I went to Kapow Comic Con a few years ago and saw some of the comic greats, but this was the first time I’d been to an event that had big named stars and all the cosplay fun that surrounds it. 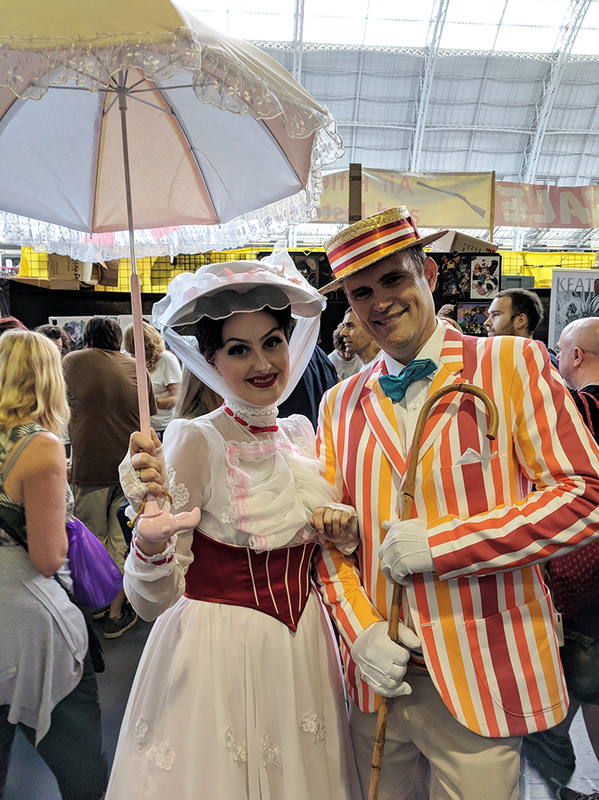 What is London Film and Comic Con? Ok, before I get a little carried away with telling you JUST HOW AMAZING my day was, I should probably cover the basics. 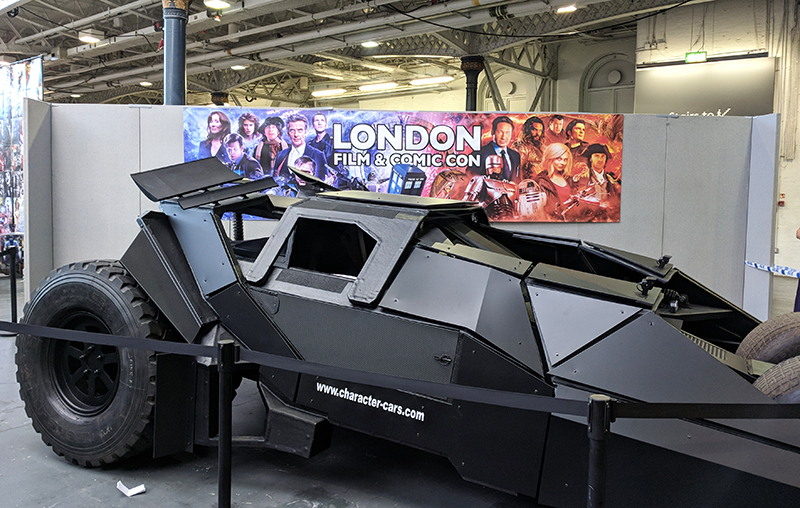 London Film and Comic Con is basically a three-day convention that celebrates the biggest and best TV shows, movies and comics around. 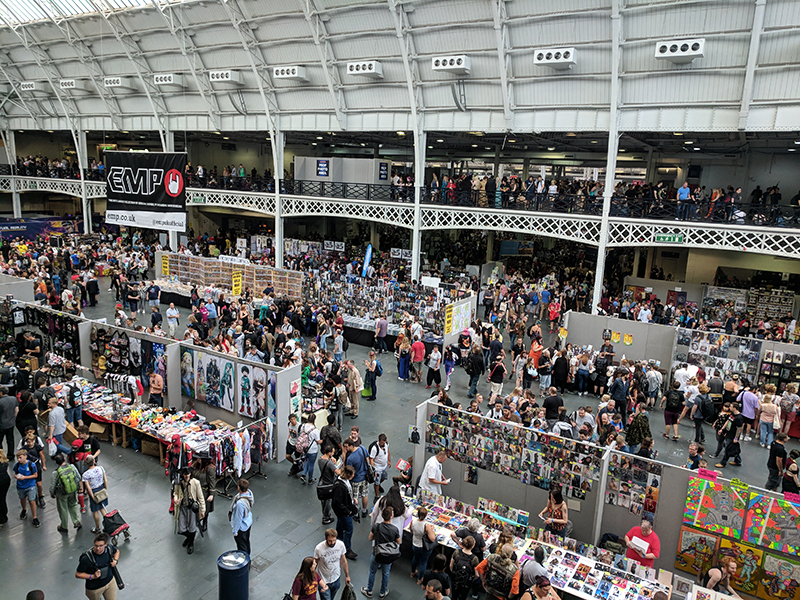 Held at Kensington Olympia, the venue features an entire floor of stalls selling merchandise, t-shirts, cupcakes, the lot…while the entire second floor plays hosts to big-name stars from TV and film that you can meet. This year, Jason Momoa (from Game of Thrones and Aquaman) was the big named star, but there was also David Duchovny (X Files) and dozens of other big names. I was predominantly there for the Doctor Who actors (Peter Capaldi, Pearl Mackie, David Bradley, Colin Baker, Matt Smith, David Tennant, Tom Baker and Christopher Eccleston were all there on various days across the weekend). This is already sounding like the nerdiest blog post ever and I am absolutely loving it. The venue opened at 9am, so me and my friend Aislinn decided to avoid the initial surge and arrive at 11. First mistake. We ended up queuing around the venue and back to the tube station for around half an hour. Luckily it moved pretty quickly and people in the queue were all chatting excitingly about what they were going to see, so it felt much shorter. As soon as we were in, my first impression was WTF. To my right there was a life-size Batmobile car; on the other, several Transformers vehicles. And straight ahead were hoards of people all milling around the various stalls. It took a while to get over the sheer size of the event, and we definitely got lost on more than one occasion. My biggest piece of advice is: if you see something you like, don’t think, “Oh I’ll come back and find that later.” YOU WILL NEVER FIND THAT STALL AGAIN. I was also shocked at how few people had actually dressed up. Don’t get me wrong, it was obvious that people had put a LOT of effort into their outfits (I saw several One Punch Mans, multiple Doctors and various anime characters), but I’d say a good 70% of people were just in normal day-to-day clothing. I thought it was a given that everyone who attended had to be in some sort of dress, but I was absolutely wrong! After getting our bearings around the two gigantic halls downstairs, we headed upstairs to take a look at the celebs. I’m not sure why, but I thought that the big celebs would be hidden away so us non-autograph paying commoners couldn’t see them. A few were, but most of them were just out on the main floor behind desks, signing away for their fans. Occasionally a small gap would appear in the huge queues and you’d get a glimpse of Peter Capaldi’s smile or Pearl Mackie’s hair, and that was about enough to leave me jumping for joy. It’s a bit of a weird thing because if you’re dressed up, people will come up and ask to either take a photo of you, or even with you. It took me a while to get used to this – where in the world would you have randomers asking to take photos with you like you’re a celeb?! Eventually, though, it all became second nature and you sort of just get carried away in the spirit of it all. So how does it work? Basically, you purchase your entrance to the venue (in 2018 it was £23 to attend on the Saturday), which gives you access to all the areas. However, you have to pay extra if you want to get an autograph from a certain celebrity or get a photograph with them. This can range from anything from £10 for lesser known actors to £200++ for diamond passes with the bigger name stars. These passes guarantee you an autograph, a photoshoot, and access to their talk. If you queue up for an autograph, you often have a little time to chat with the actor. They’ll either sign something you bring along, or they’ll provide you with a glossy print free of charge. If there are loads of people in the queue, you’ll often get a number – you have to just keep checking what numbers they’re working through at different points throughout the day, but it’s a good way to minimise waiting times. Photoshoots are usually pretty quick (in/out sort of fashion), so you don’t get much of a chance to talk to the actor. Sometimes you’ll get the opportunity to have a green screen photo with the star, but often you just end up looking tiny next to all the props. On the other hand, a normal photoshoot gets you both in the photo a lot better. It all depends on what you prefer! 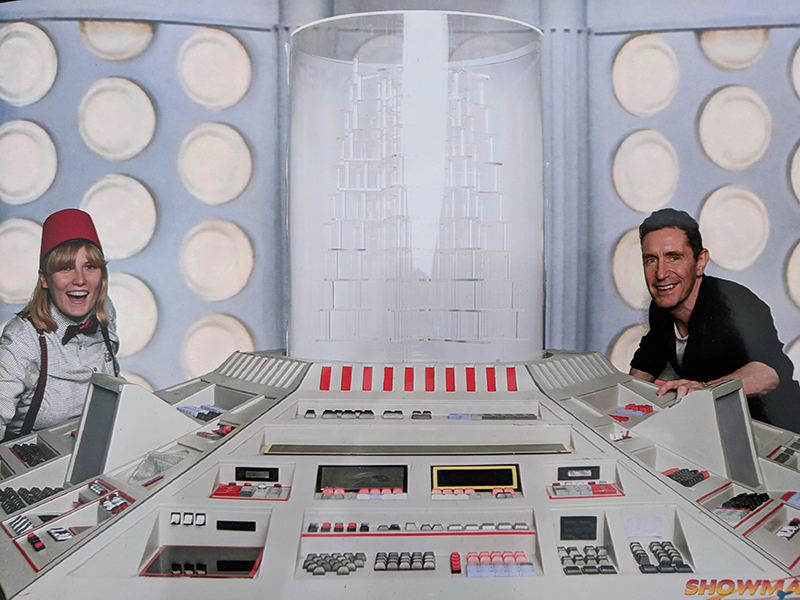 Because I’m a) the most socially awkward person ever, and b) also really really hate having my photo taken, I opted for a green screen photo of the TARDIS console with 8th Doctor Paul McGann. It was a bit of a rushed operation – you queue up outside the closed off area, before your ticket is scanned and you’re allowed in. 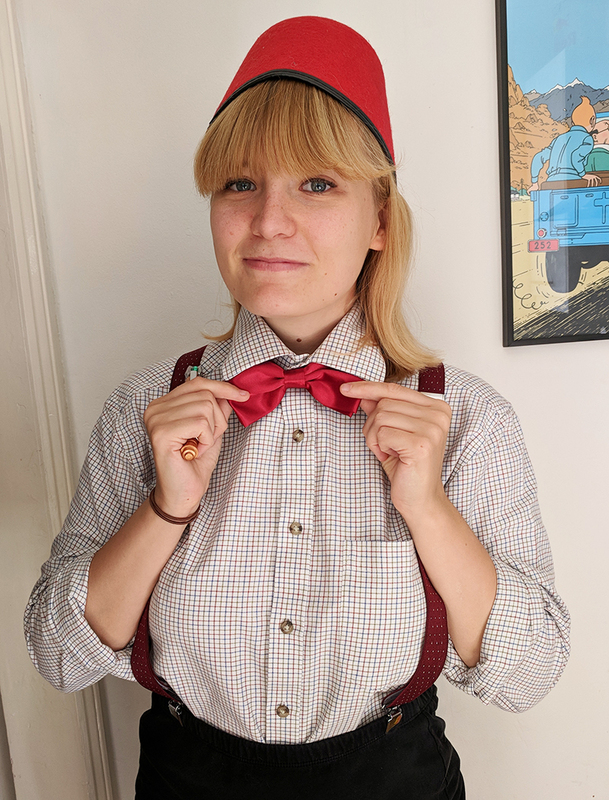 I then had about 8 seconds to say “Hello, lovely to meet you”, shake his hand, hear him say “Fezzes are cool!”, me to awkwardly reply “Thanks!” (?! ), our photo to be taken, and me to shuffle off. Jason Momoa walking right past me. Because there were so many lookalikes at the event, I half assumed it was a wannabe Momoa, but then I realised he was flagged by security and people were chasing after him screaming “JASON”, so yeah. 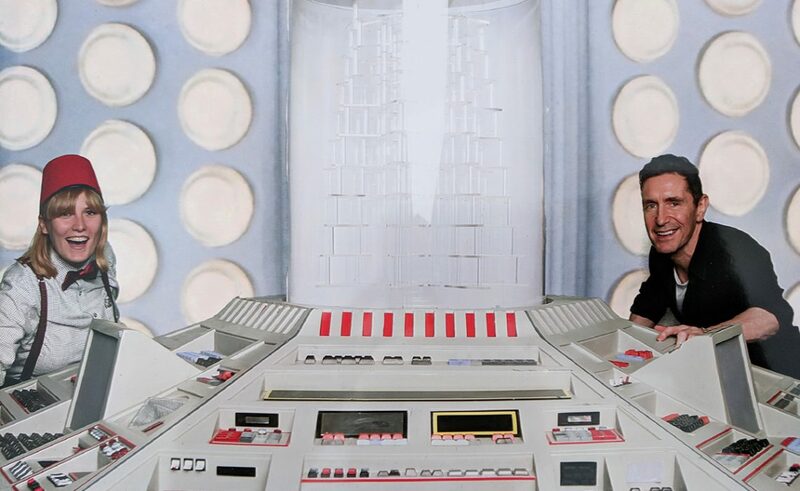 Being told Stephen Moffat was there a day early, just milling around “in a white shirt”. Like yeah cool, narrows it down. The first thing I found at the venue being a replica Batmobile which my mum TOTALLY would have gone mad for. Wear comfy shoes. You’ll be doing a LOT of walking. Take cash with you. There is an ATM inside, but it charges you for withdrawals. Most stalls and vendors only accept cash! Only dress up if you’re comfortable being photographed. Familiarise yourself with the area before you have to get to a signing/photoshoot. Often they do start late due to over-running sessions, but you don’t want to miss out if you get there late! Take some water with you – queues for the food places are LONG, and the items are way overpriced. Also mints. You’ll be doing a LOT of talking, and my mouth got insanely dry. While it’s probably best to book your photoshoots/autograph sessions in advance so that you can adequately plan (and budget), don’t panic if you want to book something while you’re there. 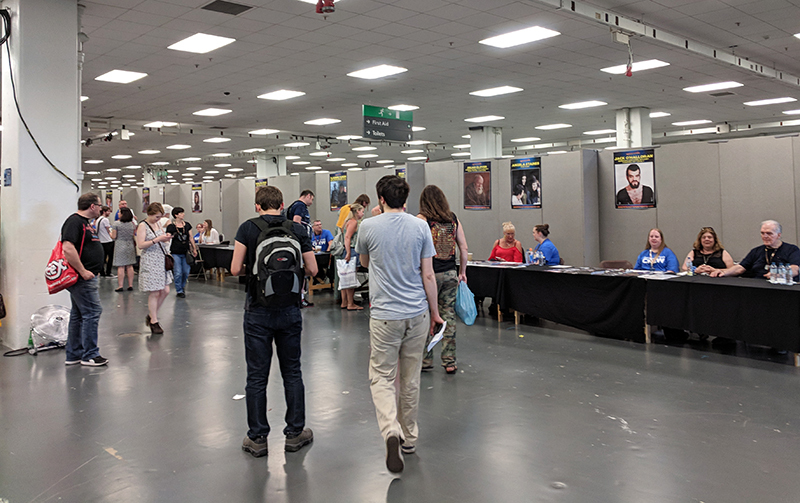 I booked my photo with Paul McGann on the website using my phone while I was walking around the convention – however, there are sales desks at the event, and you can also queue up and pay for autographs at the signing table itself. 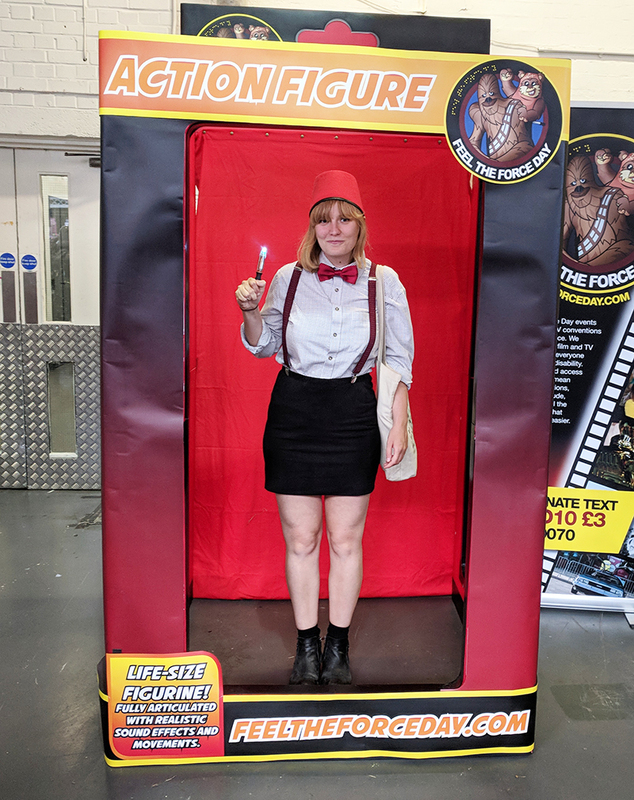 In case it’s not clear, I absolutely LOVED my first experience of London Film and Comic Con. I’m already excited for next year’s event, and I’ve even decided on my next outfit… Watch this space! Are you a fan of conventions? If so, do you have any tips? Let me know in the comments below!